Twenty five years ago, Manubhai Madhvani joined thousands of Asians fleeing Uganda in the exodus of 1972. It was a traumatic uprooting, precipitated by the ruthless dictator ldi Amin, who with Teutonic efficiency, purged the country of around 80,000 Asians in just 90 days. Madhvani's first glimpse of the dull grey skies of England was from an old army barracks set up near Stansted to accommodate planeload after planeload of refugees. Around 35,000 landed with very small suitcases and a handful of their possessions, some with no more than the shirts on their backs, as the army would often stop departing immigrants and steal everything they had. Britain, at the time, was not particularly receptive to the immigrant flood - it was the years of the fiery Enoch Powell rhetoric and his famous "rivers of blood" speech. He told a meeting in Southall that "Asian immigration was more dangerous than black power." English towns like Leicester bore warning placards: "No more Asians. Leicester is full up," "Our plight was very close to that of the Jews during the war," the 82-year-old Madhvani recalls. He had only just made his financial mark in Uganda when the order to leave came. At the time, his businesses were at their peak, employing some 12,000 people and accounting for 8-10 per cent of Uganda's GDP. He says he lost £62 million invested in property from a family business originally set up in Uganda by his uncle in 1896. Before leaving, Madhvani was imprisoned for three weeks - suspected by the Ugandan authorities of being a British spy - an episode linked to the English director of one of his companies, a man he remembers only as "Mr Stewart". Mr Stewart, based in Kampala, wrote regularly to his wife who lived in Britain. On one occasion, his letters were intercepted and opened by Amin's police. They happened to contain several political comments on the state of things in Africa including disparaging remarks about several senior African politicians. He was arrested at once and jailed and Madhvani took it upon himself to inform and liaise with the British high commission in Kampala as to the whereabouts of his employee. This angered the authorities and Madhvani was also detained and placed in the same cells as his director. The British high commission then swung into action, filing a writ of habeas corpus for the release of Mr Stewart; this was granted by the then chief justice Ben Kinwaka who only a few days later was dragged from his home by Amin's bodyguards and brutally killed. Madhvani was a Ugandan citizen at the time and his wife kept up a steady stream of phone calls to Makinde prison where he was being held. Her repeated pleas for information about her husband were persistently fobbed off. Madhvani says he really felt no danger to his life though. "It was a threat to frighten Asians by Amin, I was interrogated about various things - how many Asians I employed in my businesses, how many North Africans and so on." But when Madhvani's wife asked Amin what he intended doing to her husband, she was told: "Don't worry, he is my brother." He recalls Amin as a "rough man", a "soldier with animal instincts", a brutal man who forced his children to observe the mutilated body of their mother after Amin killed her and who had a sixth sense about plots to overthrow him, which is why many attempts to kill him failed. But Madhvani believes, as several political commentators do, that Amin's entire plan to rid the country of Asians was no more than a huge smokescreen to hide his real intentions. "Not more than 3-5 Asians were actually killed. In the enormous publicity glare that accompanied the Asian migration, Amin secretly eliminated almost 3000-4000 of his political enemies." Today, Madhvani has clawed his way back up the success ladder. Seated in his luxurious office in central London where the setting and decor speak of refinement and restraint, he is far away from these memories. A gigantic engraved seven-foot map of the world is sprawled across one wall and Madhvani's glance falls upon it sometimes like Alexander surveying the breadth of his Macedonian empire. Historians say Alexander wept because there were no more worlds left to conquer but Madhvani's genial face is serene. At the age of 82, he has achieved it all, business success, a family, the works. After the expulsion, he set up his own company in London called Indeco dealing in glass, property, technology and electronics. But he kept a 20 per cent stake in family's Ugandan based Madhvani group whose fortunes are once again on the upswing. "What does one do now," he asks mildly with a slightly perplexed expression. "I'm semi-retired," he says, with the manner of one all dressed up with nowhere to go. "Uganda is the country of my birth and I have a strange attachment to the country I was born in. It's a beautiful place, all 93,000 square miles of it. Mind you, one third is water. Anywhere you throw a seed, it grows. Plant any stick from a tree, it grows. It's a fertile country and the temperature is not high - only 15-17 degrees Celsius - ideal for agriculture - it grows 250,000 tonnes of coffee" he drones on with a faraway dreamy look sounding very much like an advertisement for the Ugandan Tourist Board. His demonstration of gratitude is to play a major role in the 25 year silver jubilee celebrations of Ugandan independence that begin all over Britain next month. These include a visit by President Yoweri Museveni and a multi-faith celebration at the Swaminarayan temple in north London. Madhvani's demons would appear curious to most of us Schedule E taxpayers who live from one salary cheque to the next. He has no fear of losing it all- he has lost it all before. Asked to enumerate his favourite novelists, he takes on the elusiveness of a Zen master. "All or none," he intones cryptically in East African English accent, brushing aside any persistence with a Sphinx-like "there is something to be found in every book one reads so they could all be my favourites or none." "Contentment is simply understanding oneself" is another of his pat quickfire answers. At 80, he has matured like a bottle of good wine - he has seen it all, done it all and nothing seems to faze him. His story perhaps bears resemblance to that of another adventurous entrepreneur who made his fortune in Africa, Tiny Rowland. Like Rowland, Madhvani has known success and failure and treated those two impostors just the same. Like Rowland, he was a pathbreaker, matching Lonrho's sprawling businesses with a £500 million sugar empire that stretched across most of East Africa. But the similarity stops here: Rowland was a man in a hurry, driven by demons, a rebel tycoon who bent the rules, bribed African dictators, and was once called by Edward Heath the "unacceptable face of capitalism." Madhvani, on the other hand, is held in high esteem by the Asian community as a gentleman who plays by the book. He admits to being an archetypal establishment man, an admirer of Gandhi, who he says embodied the virtues of patience and humility which he so admires. His one small vanity however, seem to have been to publish a book of photographs entitled A Reflection which was taken on his trips to India. The photographs are quite ordinary. "But they are my unique perception of India," he says. London, Sept. 18: Twenty-five years ago to the day, the first airlift carrying 193 Ugandan Asians arrived at Britain's Stansted Airport. The refugees who today have become one of UK's most prosperous communities, think it is time to say thank you to the British people, and the most fitting gesture they feel would be a permanent memorial to the Entebbe airlift at Stansted. "We decided to form the British-Asian Uganda Trust to acknowledge our debt to the British people. Initially, everybody thought we would be a liability but after 25 years we have been very well absorbed into society here" said Mr Manubhai Madhvani, the BUT chairman and a successful businessman who says he knows the suffering of the 1972 refugees - he spent three weeks in one of Idi Amin's jails. BUT has organised a series of events to mark the arrival of nearly 30,000 Ugandan Asians in Britain, including a thanksgiving service at Westminster Abbey on November 27 which will be attended by almost 1,000 people; and a visit to the Swaminarayan Hindu Mandir by Ugandan President Yoweri Museveni - the Ugandan Asians are grateful to his government for restoring properties that were confiscated by the Idi Amin regime. 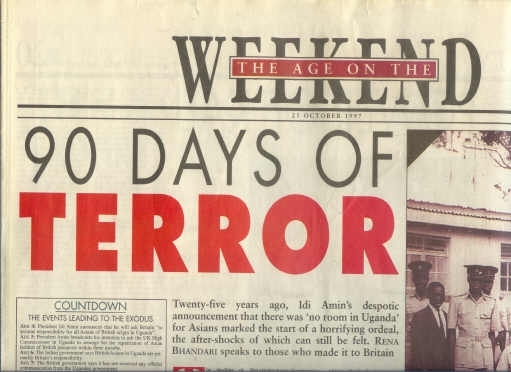 Twenty-five years ago, Idi Amin's despotic announcement that there was 'no room in Uganda' for Asians marked the start of a horrifying ordeal, the after-shocks of which can still be felt. RENA BHANDARI speaks to those who made it to Britain. were also being targeted by Amin. Many of the families being asked to depart had regarded the East African country - with its idyllic climate and green landscapes, a British Protectorate from the 1880s until Independence in 1962 - as home. Comments the first Asian woman to become a Member of Parliament in Uganda, Kampala-born Sugra Visram, "There was great despair when the news first came that Idi Amin wanted the Asians to leave Uganda, because we felt part of the country and had helped to build Uganda for decades." From Victorian times Indians had travelled to East Africa - pioneering traders included Allidina Visram, Nanji Kalidas and Vithaldas Haridas - helping to forge a future for the region. Winston Churchill acknowledged in his book My African Journeys: "It is the Indian trader who has, more than anyone else, developed the early beginnings of trade and opened up the first slender means of communication. It was by Indian labour that the one vital railway, on which everything else depends, was constructed. It is the Indian banker who supplies perhaps the larger part of the capital yet available for business and enterprise, and to whom the white settlers have not hesitated to refer for financial aid." Lawyer Balu Radia's businessman father arrived in Uganda as a trader in 1906 and went on to become a cotton ginnery owner. Says Mr Radia, who himself rose to occupy the number three position in Uganda's Department of Public Prosecutions, "We did not foresee that we would be forced to leave almost overnight. I worked in the family business in Kampala for some years and like everyone we went along with British policies. There was a structure of racism - English, Indian and African schools, for instance - but things were relatively harmonious and there were no problems." The wind of change arrived in 1962 with Ugandan Independence. Adds Mr Radia, "Africanisation came, which meant less opportunity for our children in education and business. We understood and accepted the need for democracy in Africa. But we assumed change would happen gradually - if so, Asians could have adapted themselves to it." Idi Amin's coup overthrowing Prime Minister Obote in 1971 brought to an end their hopes of racial harmony in the new Uganda. Mr Radia comments, "When he was Commander-in-Chief of the Ugandan army, Amin got on all right with Asians of influence. I don't think he had anything personal against Asians, but to get rid of them was a popular step. It's difficult to say whether it was also insanity - there was method in his madness." Recalls Alvaro Collaco, a senior civil servant in the Ministry of Finance with responsibility for preparing Uganda's annual budget, "In 1972 as he was setting the scene for the Asian expulsion, President Amin summoned the Asian elders to the International Conference Centre and accused them, among other things, of failing to ensure the integration of the Asian and African communities through inter-marriages. Until Independence in 1962, Uganda had had racial segregation in schools. If that was where integration first begins then it was premature of the President to expect within 10 years the changes he was referring to." It is a sign of the predominantly stable and long-standing relations between the two communities that little animosity was shown by ordinary African citizens towards Asians in Uganda during the 90 day deadline period. The army was a different story: for example, soldiers relished rifling suitcases as the expelled made their way past checkpoints to the airport. Even so, surprisingly few Asians 'disappeared' during this time, among them Anil Clerk, a political ally of Obote. In many cases, however, business and life continued with relative normality, disbelief overtaking despair. Mr Radia says the turning point for everyone - when both Asians and Britain realized Amin really meant business - was after he sent his bodyguards to fetch leading industrialist Manubhai Madhvani. "Amin had him arrested and put in prison for no reason. That's when people started packing, drifting from smaller towns into cities to be safer before they could get onto an aeroplane." The departees were allowed to take only £50 each out of the country with them; leaving behind businesses large and small, homes and most of the belongings which could have brought back memories of their previous lives. The race relations correspondent of the Sunday Times noted, "It says much for the spirit of the Asian community in Uganda and their general desire not to be a burden on anybody, that the British Government had to pay for the air fare of only two people out of the 27,000 who came to Britain and the 4,000 who went to Europe." Many of Uganda's expelled Asians quickly went on to build successful lives in the west: retraining, entering the professions and setting up their own businesses. Comments Mr Radia, "It was tragic to be thrown out of Uganda, but good in the long run that whole families came to Britain. It meant we could give each other morale support if not financial help, and we were not socially isolated. That helped us re-establish ourselves." Meanwhile, Idi Amin had to get out of Uganda pretty quickly himself in 1979, after being overthrown by Obote. Airlifted away from trouble by the Libyans, he now lives in relative obscurity in Saudi Arabia, where the authorities have barred him from giving interviews. Uganda's current President Yoweri Musevini is actively encouraging Asians to return to their old homeland, to help regenerate the nation's economy.